The big point of the webcast was to suggest that most companies focus on such a narrow niche of the entire market – those in the lower left, they never see, consider or hire some of the best people available. These are the people in the upper right corner of the talent market. In the graphic, candidate quality is represented by the vertical axis and the differences in recruiting strategy and processes are shown on the horizontal axis. The rectangles represent different pools of active and passive candidates. The talent strategy on the left is one based on cost of hire and process efficiency. This is a high-tech, impersonal transactional process emphasizing the employee brand to attract people and using skills- and experience-laden job descriptions to weed out the weaker ones. People hired on this basis are offered lateral transfers within semi-rigid compensation bands. Collectively, this approach makes it difficult to reach the top 25% of any talent pool unless the company is an employer of choice in its market and/or there is a surplus of top people to choose from. The talent strategy on the right is a high-touch personalized process focused on the impact and ROI of those people being hired. Attracting the top 25% of any talent pool requires a consultative approach using skilled recruiters partnering with fully engaged hiring managers. Candidates hired are offered career opportunities that best match their abilities and interests. 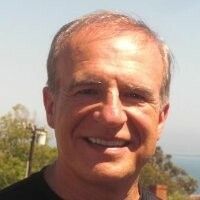 This is a proactive strategy targeting passive candidates in the upper right corner of the talent market. Understanding the differences between the talent pools allows recruiting and HR leaders to develop the required strategies and tactics to penetrate each market. The pool sizes are relative to the “X” in the center left. This represents one person who has applied, is skills- and experience-qualified and is hirable. 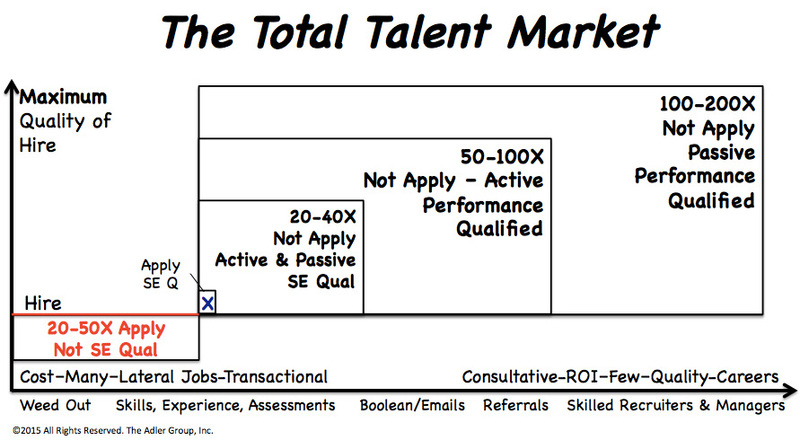 The talent pool to the right of the “X” is filled with 20-40X as many skills- and experience-qualified people who didn’t apply. Either they didn’t see the job posting or, if they did, they found the job uninteresting. The best way to reach this group of skills- and experience-qualified people is by searching through resume databases and sending the most qualified a sequence of compelling messages via an Avature-like CRM system. Unfortunately, the messages usually sent are as equally uninteresting as the posted job description resulting in only a few extra applications. The two other markets on the far right are huge in comparison to the talent markets most companies pursue. The big difference is that these people are performance-qualified rather than skills-qualified. Performance-qualified means they can do the work exceptionally well but bring a different mix of skills and experiences to the table. These two markets are comprised of all high-potential, diverse and non-traditional candidates. Some of these people are active job-seekers but most are passive – especially those who are the most talented and in high demand. It’s important to recognize that the most talented people accomplish more in fewer years with less or a different mix of skills. This is what performance-qualified means. Using this criteria for outside hiring instantly expands the talent market, yet some hiring managers are fixated on using criteria that eliminates these people from consideration. Implement a talent strategy driven to maximize quality of hire rather than focusing on cost reductions and improved efficiency. Convert every skills-based job description into a performance-based job description. This will be the basis of determining if the person is performance-qualified or not. Train your recruiters and hiring managers in consultative recruiting techniques. Focus on attracting the best people rather than weeding out the weakest. Design a new-age apply button embracing UX – the “user experience.” The new one will be easier to find and fun to interact with, but harder to press. The talent market is huge. The best people are in the upper right corner. Stop trying to find them in the bottom left.